This feature is designed to complement other pages within this website which cover now-closed railway routes into Cambridge. We will therefore not be repeating information on those routes here in any detail. Similarly, we will not be covering the histories of the numerous companies which came to constitute the Great Eastern Railway, excepting brief details of the Eastern Counties Railway and its constituents where relevant to Cambridge. In intending to cover all aspects of Cambridge station and the railways of Cambridge, it has not been practical to adhere rigidly to a chronological order and this has been further complicated by the fact Cambridge was served by no less than four pre-grouping railway companies, who arrived in Cambridge at different times and who all had their own facilities at one time or another. The story is therefore told by dividing it into specific periods and into specific events. It has sometimes been necessary to fully describe a particular aspect of Cambridge station by progressing through several decades and this has been dictated by what photographs are available. An example is engine and goods sheds; this is included in Part 2 covering the Pre Grouping period but it has been necessary to use some photographs from the BR period. Photographs have been a problem due to a lack of subject variety. Photographs of certain early BR diesel locomotive types at Cambridge are scarce although we have been able to use a few. Similarly, photographs of diesel railbuses at Cambridge station have proved elusive as have photographs of diesel-hauled King's Cross outer suburban non-corridor trains at Cambridge, yet they ran to and from Cambridge right up until the late 1970's. Enthusiasts and photographers tended to ignore these trains, instead concentrating on the so-called Cambridge Buffet Express, and this is great shame from the historical point of view as it only tells part of the story. Notwithstanding these problems, an attempt to show the wider Cambridge railway scene has been made and we hope readers will find it interesting and informative. If anybody has any of the elusive pictures mentioned above and which we could use here non commercially we would be very grateful. Finally, line closures, other than the original Newmarket line, are only given brief mentions within the text because these are covered on the main Disused Stations website. Part 3: The Big Four period. Part 5: British Railways - The steam era. Part 7: British Railways - The diesel era. In April 1958, two local trains prepare for departure from the north bay platforms at Cambridge station. On the left in platform 5 is class B12/3 4-6-0 No. 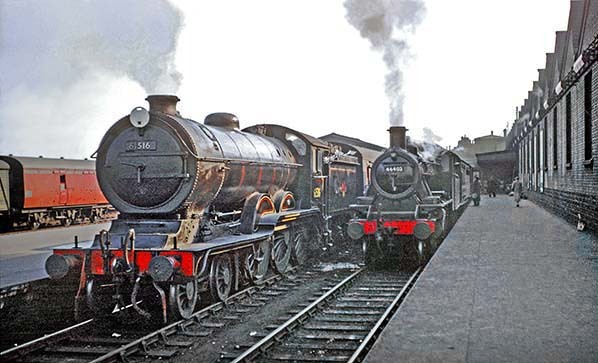 61516, while on the right in platform 6 is LMS Ivatt 2-6-0 2MT No. 46403 with a train for the Kettering line via St. Ives and Huntingdon. 46403 was a Kettering (15B) locomotive from new in December 1946 and a regular visitor to Cambridge. Later transferred to Stirling (64B), she was withdrawn in June 1964. At this time 61516 was a Cambridge locomotive and was withdrawn just three months after the picture was taken. In knowing the date, the orientation of Cambridge station and by looking at shadows we can determine the time is late afternoon. The Ivatt will therefore be operating the final train of the day to Kettering, the 5pm. What the B12 is up to is less easy to determine but there was a service to Harwich around this time of day. On the far right, electric lighting has replaced the cantilevered gas lamps on the engine shed wall. This change came about towards the end of 1955 (see Part 6). On the far left can be seen a Thompson-designed 6-wheel passenger brake van. Classified 'BZ', a batch of 80 of these had been built at Stratford in 1950; an example of BR continuing to build pre-nationalisation designs in its early years. These 6-wheel vans and in particular the ex LMS 'Stove' vans remained a common sight until well into the BR blue era; most ended up in all-over blue but a few received blue/grey livery. Following withdrawal, the underframes proved a boon for restoring vintage carriages which had spent decades in grounded body form as summer houses, sheds, holiday chalets and so on. Other 6-wheel vans survived into preservation in their original form. Despite being passenger brake vans, the Thompson 6-wheelers did not have gangway connections.